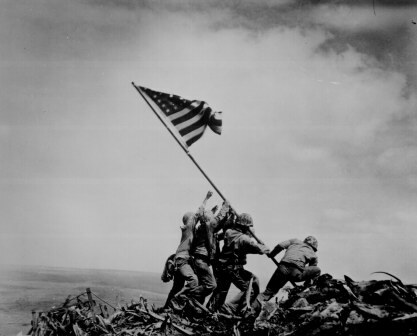 As History.com notes, on this day in 1945 Marines raised the American flag on the island of Iwo Jima. I have never been able to fathom the courage and sacrifice of the men in WW2. I wonder if I could have made the grade. They were the greatest generation. My late father lived through the depression and worked in the Civilian Conservation Corp as a teenager before he joined the U.S. Army. He later married my mother had they had my older brother and sister prior to WWII. Despite being a veteran and married with children, he joined the Navy and became an Underwater Demolition Team (UDT) frogman in the Pacific. UDT hit the Japanese-held islands prior to the Marine landings. They were genuine tough guys and heroes. When I was serving on an aircraft carrier during the Vietnam War, I wrote my father and complained that we had been to sea for too long a period and I was looking forward to hitting the beach at Subic Bay & Olongapo in the Philippines. My father wrote back and mentioned that when he hit the beach there were 40,000 enemy Japanese waiting for them. Thanks for sharing the story, Paul. Of course, just to put some levity back in the conversation, there were considerable dangers waiting for sailors on Gordon Street dives (just across the bridge).